For the generation of millennials who hadn’t see or live the era when smartphones are not the favorite toy of kids and video games are just 2-4 hours games and outdoor games were more fun and enjoyment. We are sharing some rare and never seen before pictures of different places of India and people. Hope you like it and share on facebook with friends. Note: All Photographs and Images are copyrighted to their respective real owners. Miss Universe and Miss World. A 90’s Photograph of both the girls during stage sharing at some function. Very rare photograph of superstar actress Madhubala. Life Magazine shoot. Rare photograph of then President of India Dr. Rajendra Prasad at market ferry with his President Guards. Only or True Photograph of infamous Dacoit aka Bandit Queen – Phoolan Devi. Funeral of Saint Ram Krishna Paramhans (Kolkata) young Vivekanand (4 from left). Sachin Tendulkar with Best Friend Vinod Kambli. Indian Opera House at Banglore, MG Road. Rare picture of Nationalist Nathuram Godse (who shot Mr. M.K. Gandhi thrice). Extremely rare and real face picture of Nationalist and Revolutionist, head of Hindustan Socialist Republican Association. Printed poster of 1930 infamous justice, Declaring the Death Sentence to Bhagat Singh, RajGuru, Sukhdev and their other companions. Rare picture in candid moment of then Indian Prime Minister Mr. J.L. Nehru and the First Lady Jacqueline Kennedy(Wife of then President of America) watching a snake charmer. Indira Gandhi with Campion Kapil Dev. Ooty (Tamil Nadu) 1880 photograph. Rare picture of school cricket team. Sachin Tendulkar and Vinod Kambli. In action Indian Satyagrahis demonstrating against the British Raj. A very rare picture. SuperStar SRK and his girlfriend Gauri Chibber (Now Wife). Sir Mohinder Dhillon (Punjab), who was also one of Africa’s greatest cameramen on the deck of British Navy in Kenya, 1967, (in background Cockerel -Fighter Helicopter). Rare picture of execution 1857 of two first Indian freedom fighter being hanged by Britishers during the First Freedom Struggle of India. Relaxing time. Rare picture, Anil Kapoor with Director Yash Chopra and Co- Actress SriDevi. Gabbar ka Biscuit. Ad poster of Glucose-D biscuits featuring Amjad Khan (Gabbar Singh “Sholay”). Beautiful Zeenat Aman on Air India Advertisement Poster. Rare photograph of Swami Vivekananda (sitting) and companion Narasimhacharya, during their stay in America. Governor General of India, C. Rajagopalachari, sharing a sweet hug with Lady Mountbatten at Farewell, 1948. Beautiful Actress Seetha Devi. A silent movie actress 1925. Our Beloved Prime Minister of India Narendra D Modi in NCC dress during his schooldays. Acclaimed singer K. J. Yesudas with young A. R. Rahman in studio. Our Beloved and most popular President Of India A.P.J. Abdul Kalam during his college days. Famous Rolls Royce Car Depot in Bombay. Very first India Cricket Team Tour to England, 1886. Famous people at Oxford University Convocation on 7th of August 1940, Dr. S. Radhakrishnan, Rabindranath Tagore and Sir Maurice Gwyer (from left to right) at Sinha Sadan. Now President of India, Pranab Mukherjee during his 30’s . Family photo of Netaji Subhas Chandra Bose. British Police caught Netaji. last successful caught. After this he never caught by Britishers again. A rare photograph of gala time enjoy by Sehwag, Sachin, Zaheer and friend. Indira Gandhi and Nehru Baba with Charlie Chaplin at Bürgenstock, Switzerland in 1953. The Great Khali at local Akhada during his early days. Family picture of Baba Saheb Dr. B.R. Ambedkar associates he is sitting in the center, a walking stick is in his hand. 1910, marriage view of His Holiness Yuvaraja Sir Sri Kanteerava Narasimharaja Wadiyar to Her Holiness Yuvrani Kempu Cheluvammanniyavaru Urs in Mysore. Prof. R Narasimhan guiding Pundit Nehru at Tata Institute of Fundamental Research Automatic Calculator-TIFRAC. He is the architect of the first digital computer in India. Shooting Time, Rekha, Randhir Kapoor with Raj Kapoor in 1970. First Indian Woman Pilot – Sarala Thakral with her plane. She was 21 when picture taken. 1858, Secunderabad, Picture taken after a mass slaughtering of around 2000 rebels, you can see the skeletons of humans. Explaining his famous Raman’s Effect to the learners at his lab Sir C. V. Raman. Here a student of Madras University(1948), tied his hair to a nail to keep from falling asleep while studying. This technique is usual in college and universities. 1994, Team India after their winning match enjoying themselves in dressing room. Kapil Dev, Sachin, Moh. Azharuddin. Late Veteran actor Zohra Sehgal in her younger days of acting career. Second Runner up Miss India Contest Zeenat Aman in 1970. Rare Photograph of Netaji Subhash Chandra Bose with Adolf Hitler. Albert Einstein and Nehru at Princeton, USA, 1949. Funny picture of Raj Kapoor, Dilip Kumar and Dev Anand. Aerial view of victoria ground Kolkata 1870. Shah Rukh Khan, Sohail Khan and Kapil Dev in action at Bollywood Celebrities and Cricket Players friendly football match. High School Football Team, Guess who is in center….. (Barack Obama). In 1977, Billionaire MicroSoft CEO, Bill Gates caught by police for driving without DL (Driving Licence). I think It’s his first mugshot, he is smiling. Queen Elizabeth posing at military medical corp camp during World War 2. From the right second last in green shirt. Guess ? He is Osama Bin Laden. 1970’s picture. Osama Bin Laden after practising judo. Great Minds discuss ideas. Apple and Pixar founder Steve Jobs and MicroSoft founder Bill Gates in a very deep conversation. Runners at first Modern Olympics held in Athens in 1896. 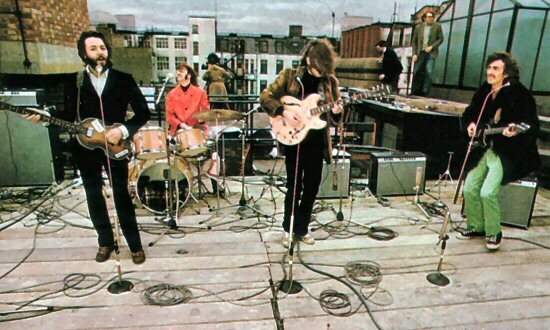 Beatles’ Famous Rooftop Concert 1969 were band’s last concert. 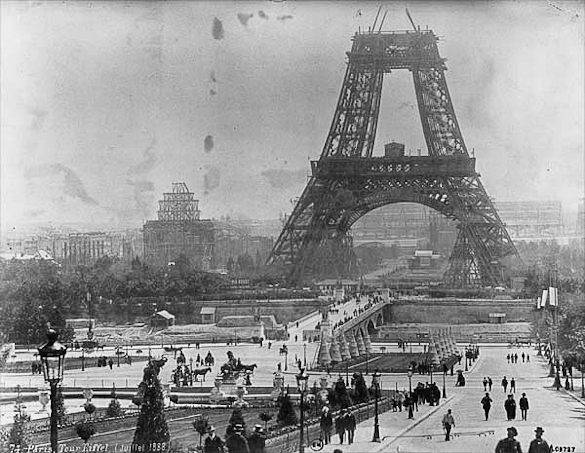 Construction of Paris Eiffel Tower, 1880. Some of the early sketch of Mickey Mouse by Disney. Previous Get Radiant and Glowing Face by Tomato Face Mask. Next Bollywood Characters Famous Dialogues. My Fav. is Mogambo Khush Hua! !